Design Joomla Template JB Sketch is ideal for creating a personal blog or portfolio, and even for creative business website. Template JB Sketch made in the original style, which will not only take its rightful place among the online resources, but also beneficial to stand out among similar projects. Template JB Sketch has 7 preset color schemes for the interface under the textured stone, wood, grass, water, clouds, or simply dark scratches. Also in the template JB Sketch has 30 positions for installation of modules and slideshow scrolling news. 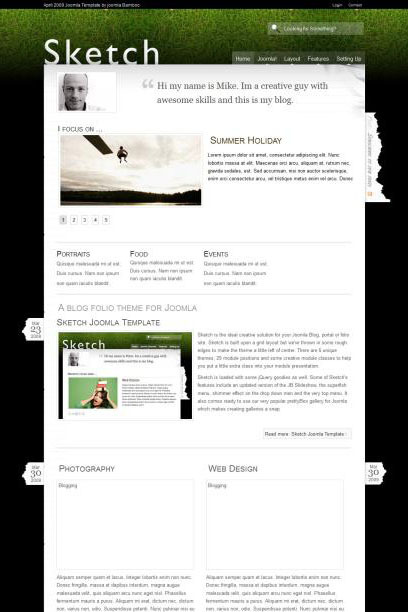 Template JB Sketch is compatible with the version of Joomla 1.5.